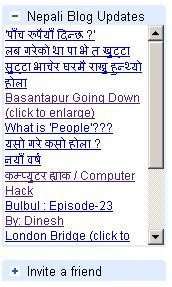 Just discovered that "Nepali Blog Updates" widget can be added to your Gmail service. or enabling the lab feature under settings menu. Remember, If anything goes wrong with the labs, there is always an escape: go to labs=0 feature. https://mail.google.com/mail/?labs=0. Once the lab is set up, you should be able to see the green beaker logo near the top right corner. Go to the Labs menu, at the bottom part of it, there is "add gadget by URL" feature. You should be able to see the Gadget on the left panel below the chat box in Gmail. 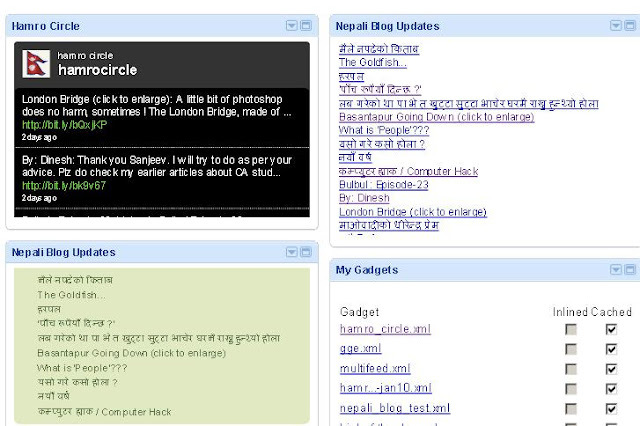 If you are an igoogle user, it should be a piece of cake to be added in your igoogle page. and click on the "+" sign at the left bottom corner. Currently I have 3 versions of Widget for testing and back up purposes. Maile khoji ra thiye tapailey post gari dinu vhayechha. Dherai dherai thnx hai.